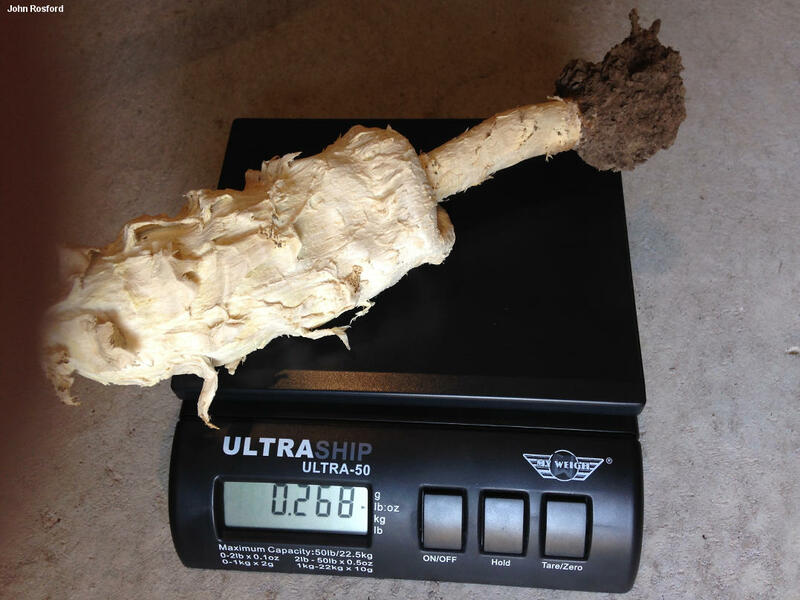 Podaxis longii is an amazing desert mushroom, thrusting itself up to nearly 20 inches high on a thick, woody stem. 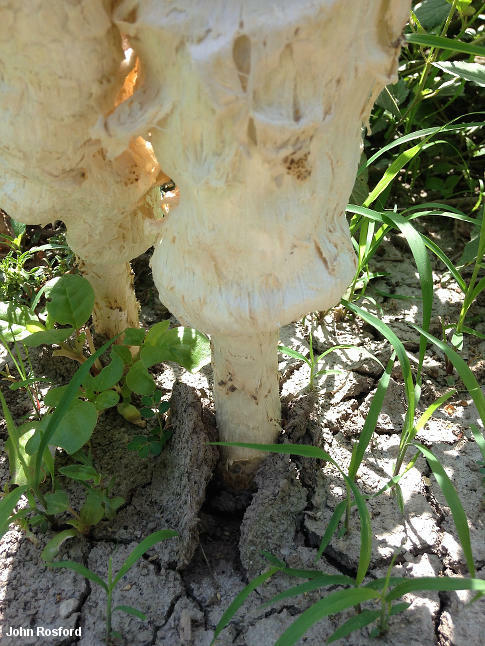 In many ways it is reminiscent of Coprinus comatus, the well-known "shaggy mane," but it is larger and tougher than that species, and does not feature well-formed gills; instead, it has an irregular puffball-like interior that eventually turns into spore dust and disintegrates. 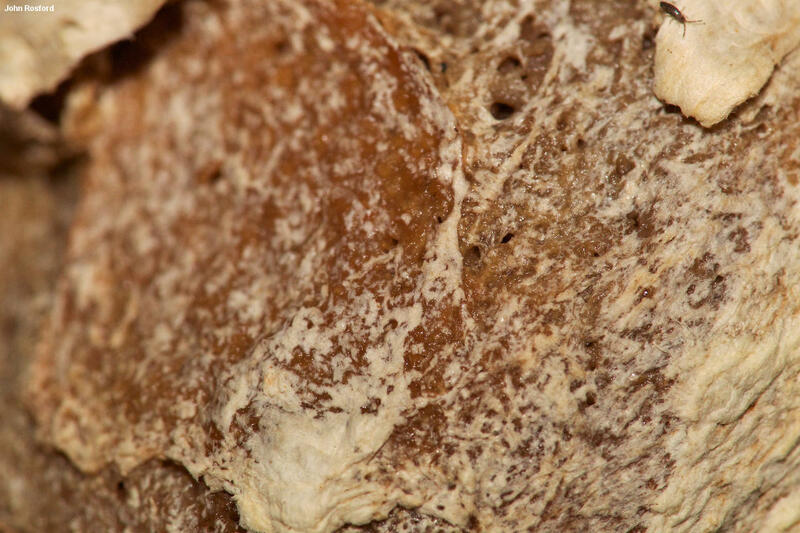 It is closely related to the better known and more widely distributed Podaxis pistillaris, which also appears in arid ecosystems, but that species is significantly smaller and features larger spores. Although it was officially described in 1985 (McKnight), Podaxis longii was recognized in an unofficial way by Long in the early 20th Century; McKnight used the epithet longii to recognize Long's earlier, unofficial contribution. 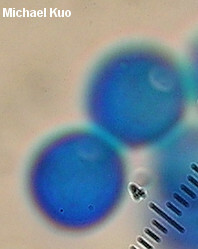 A 2001 treatment of Podaxis argentinus in Argentina by Dios and collaborators, in my opinion, actually describes Podaxis longii, given the robust dimensions and microscopic characters of the described collections (and given the fact that the authors were apparently unfamiliar with McKnight's earlier Podaxis publications, since they are not mentioned or cited). 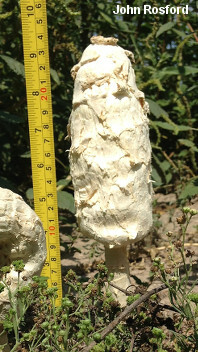 McKnight reports Podaxis longii from Argentina. Thanks to John Rosford for collecting, documenting, and preserving Podaxis longii for study; his collection is deposited in The Herbarium of Michael Kuo. Ecology: Presumably saprobic; growing alone, scattered or in small troops in arid, desert settings--including wasteland, fields, and urban locations; spring through fall (but tough, and sometimes lasting over winter); southern California, southern Arizona, and Texas; also recorded from Argentina, and therefore probably to be expected in the arid regions of Mexico and Central America. 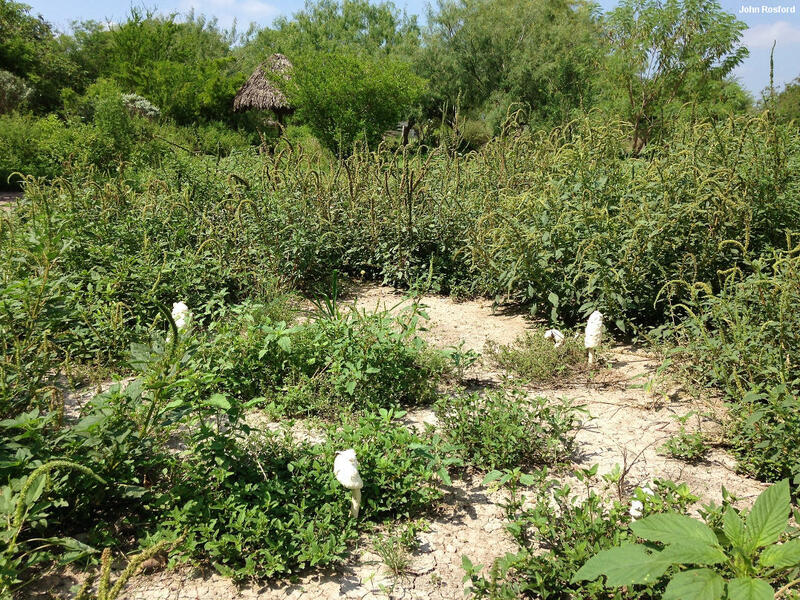 The illustrated and described collection is from southern Texas. 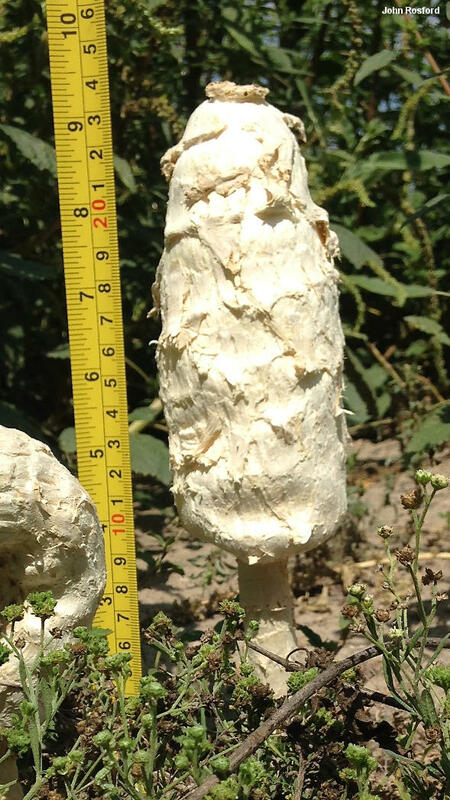 Cap: 8-18 cm high and 4-8 cm across at maturity; oval when very young, but soon more or less cylindric, with a rounded apex; shaggy to scaly; sticky when fresh, but soon dry; white to whitish or pale brownish; the margin tucked under and attached to the stem. Interior: Ranging from fairly solid and marbled in appearance to being composed of vaguely gill-like, contorted plates; at first whitish but soon brownish and eventually reddish brown; at maturity turning into brown powder. 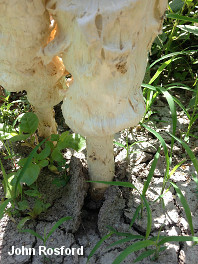 Stem: 8-20 cm long; up to 3 cm thick at apex; more or less equal above a swollen base that is usually buried and rooted in the sand; extremely tough and woody; coarsely fibrillose to scaly; sticky when fresh, but soon dry; whitish to brownish; without a ring; in old age sometimes remaining after the cap and spore mass have deteriorated. Odor and Taste: Odor not distinctive. 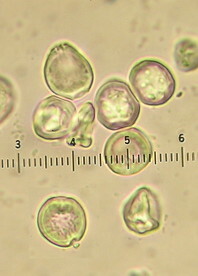 Spore Print: Not obtainable as a "spore print," but mature specimens shed brown to orangish or reddish brown spore powder profusely. 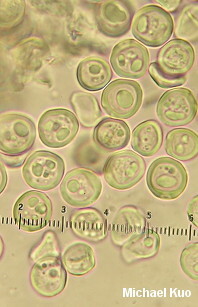 Microscopic Features: Spores 6-10 (-13) x 6-8 µ; subglobose to broadly ellipsoid or irregular in outline; very thick walled; hyaline to brownish in KOH; yellowish to brownish in water; with a shallow, wide (1-2 µ), elliptical pore; rarely with a very tiny (under 0.5 x 0.5 µ), stublike sterigma. Capillitium thick-walled. REFERENCES: McKnight, 1985. Herb. Kuo 07171401.